In 1835, famed French political thinker Alexis de Tocqueville arrived in Manchester (UK), which at the time of his visit was an industrial city of 300,000 people that was unrivaled in both scale and activity. The impact of the growing number of factories on the form and character of the city left a pronounced impression on de Tocqueville, who wrote that “their six stories tower up; their huge enclosures give notice from afar of the centralization of industry”. de Tocqueville’s prose, much like the factories which mark its distinctive cityscape, serve to reflect the fact that carbon has long been an inextricable aspect of Manchester’s cultural legacy. Almost two hundred years later – although Manchester has shifted from being a global paragon of industry to a diversified economic center – a locally based Community Interest Company (CIC) is actively working towards writing a new, low-carbon, installment into the story of the city. The Carbon Literacy Project, an initiative of Cooler Projects CIC, has pulled together a Working Group of 30 organizations that are united by a single, focused pledge: to provide a day’s worth of learning about climate change for everyone in Manchester, therein ensuring that “all citizens will be carbon literate”. The idea behind being carbon literate relates to awareness; specifically, awareness of the carbon costs and impacts of everyday activities, which in turn feed into the ability and the motivation to reduce carbon emissions at each the individual, community, and organizational levels. With this in mind, the consistent – yet customized to ensure relevance – content delivered through the Project is tailored towards three distinct audiences: people who live, people who work, and people who study. Delivery is peer-to-peer – because “people like us” are quite frequently the source of information we are most likely to trust – and an intuitive e-learning framework is also in place. The Carbon Literacy Project taps into and scales-up grassroots climate action in Manchester. In 2009, the City officially introduced its first Climate Change Action Plan: “Manchester: A Certain Future”, which was the culmination of a citizen-driven, bottom-up approach that utilized crowd-sourcing. Yet while the Carbon Literacy Project is concentrated in Manchester, anyone (from anywhere) can receive a tailored course from the Project through its e-learning platform; the flexible framework of the Project ensures that geography is not a restriction to any interested party seeking to access its materials. de Tocqueville was drawn to Manchester to see the “thirty or forty factories [that] rise on the tops of the hills” for himself, yet it is the search for further funding that has brought the the Carbon Literacy Project team to Paris, COP21, and the Cities & Regions Pavilion. The group has submitted and presented their Project within the framework of ICLEI’s Transformative Actions Program (TAP), and they are hoping to meet with financing agencies – as well as with like-minded individuals and organizations – who can help them scale-up their operations. The Project, which is a registered charity, has reached the stage where the demand for the service outstrips the capacity that the small number of full-time staff (3) can provide (particularly in regard to providing accreditation, certificates for courses, sponsorship). Consequently, they have found themselves in a veritable start-up “catch 22”: they need to employ advocates ahead of the revenue stream, yet they do not have the capital needed to make this a reality. Although the anecdotal responses to the Project are fantastic, the capacity is not yet there to capture this response and subsequently communicate the impacts which are vital to securing both interest in the project and sourcing further funding. At a fundamental level, literacy is about connecting the dots; generating understanding by bringing clarity to something that was previously obscure. The Carbon Literacy Project has not only accomplished this through its educational outreach, but has also helped to bring definition to the landscape of climate change action already at work in Greater Manchester. 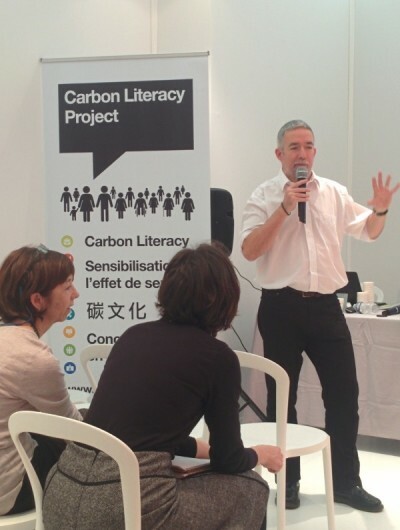 The Project catalyzes and generates genuine partnership which transcends sectors, as the Carbon Literacy Project Working Group takes many of the great projects and initiatives that are already underway and connects them together. Through writers like de Tocqueville, literature – once upon a time – reflected the reality of the Manchester cityscape. Through the work of the Carbon Literacy Project, this process may soon be reversed: the written (and very well-spoken) word will be reflected on the urban character of the city, and beyond.